I experimented a bunch in developing this recipe and finally, here it is, ready to be posted for you! These gluten free - flours from scratch - flatbreads are da bomb! As fall approaches, people will be pulling out crockpots and stew recipes. These flatbreads are perfect to accompany chilli, stews and of course, curries. You will love them even if it seems like a lot of work, it's simple to do and you can prepare several cups of flour and keep in labeled airtight jars. You can use a variety of flours, milks and oils, just watch the proportions. 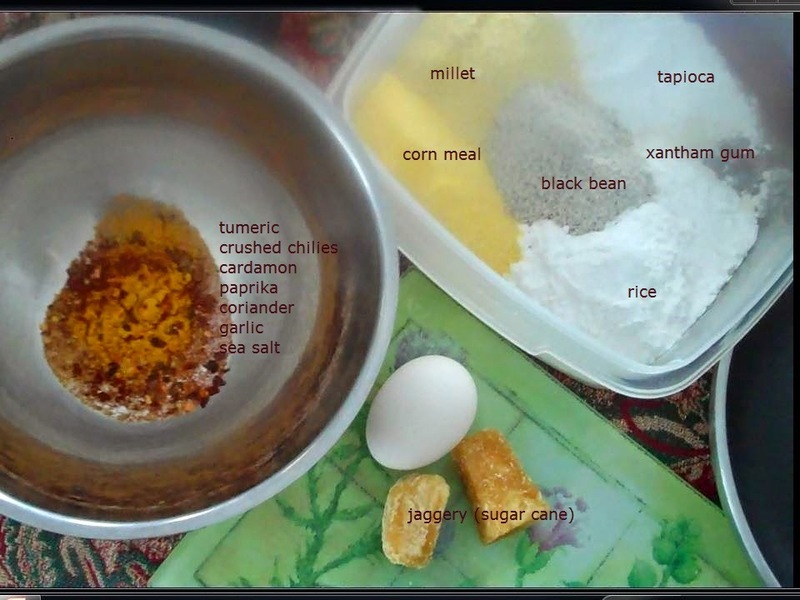 I invite you to innovate and create your own sunny spice mixes but first, try one of the two mixes I wrote below. If you already know what will accompany your flatbreads, consider how to harmonize the spices with the taste of the other dish. To make flour, simply pulverize a grain or bean. Imagine how beneficial this will be, to grind your own quinoa instead of searching for and paying triple the price for quinoa flour. Plus, you can go organic! Drip consistence: like a crepe mix, thinner than a pancake mix. Mix dry ingredients and using a whisk or mixer, beat in the egg, milk and oil until smooth and all flours are scraped from sides. Add water as needed for a drip consistency. Heat skillet or a non-stick pan with a drop of oil on the stove top and preheat oven at 350F. Cook the batter like you would crepes: using a ladle, drop batter at center of pan which you let droop towards the edges as you glide the pan in the air... as you set it down horizontally, have a mindful moment... bringing yourself back to now and back to the reasons why you are so lucky and happy and grateful to be here. What beautiful abundance there is in this fine dish! Why do I feel so rich and empowered? Let the aromatic pancake sit on the high heat 5-8 seconds, it’s very quick. When bubbles appear at the surface, flip and cook for 20-30 seconds before transferring to the oven straight on the wire rack. Bake at 350F for 12-15 minutes, flip once and serve slightly chewy or bake until crisp for about 10 more minutes each. If you are not eating them all in one sitting, it is best to crisp them up. You can turn the oven off and let them cool in there before storing in a container. You can also break them up into pieces to eat like crackers, they'll be easier to store than the round pancake shape. The center got soggy with this test but it still tasted very good! The eggless version needs more cooking time in the pan, on the first side, otherwise it collapses and folds over but you can still bake it, it'll be thicker. A few more tips before I finish: I use mason jars for everything around here these days, including storing flours. The milling blade that came with my baby bullet has been fantastic. What a gift! That’s what I’ve been using to make flours and almond meal and for walnuts for fudge, etc. *smile* Speaking of sweet things, jaggery, in case you’re wondering, is cane sugar and has a very subtle caramelized taste. I bought it at an Indian grocer. Tapioca flour or starch, they’re the same thing, is very affordable at Asian markets. Did you like this recipe? Show us Your Sunshine!